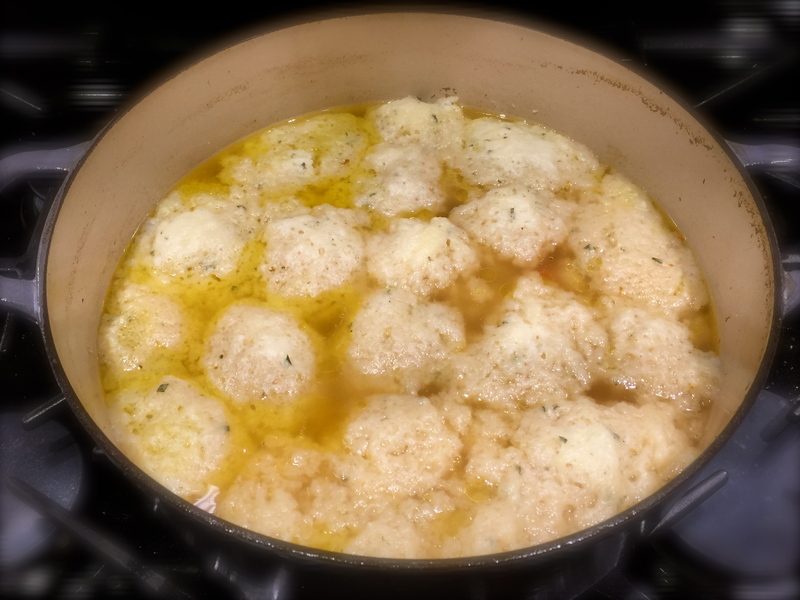 Mom’s Chicken Soup With Dumplings… – You Betcha Can Make This! Most of you know by now that my mom wasn’t much of a cook. She led a busy life raising two kids and working (and you have to remember, at that time women were staying home when they had children) and so her meals were pretty rudimentary – meat, potatoes, peas or corn – that was about it. But there was one meal she made that was over the top fabulous and that was chicken soup and kugelis. 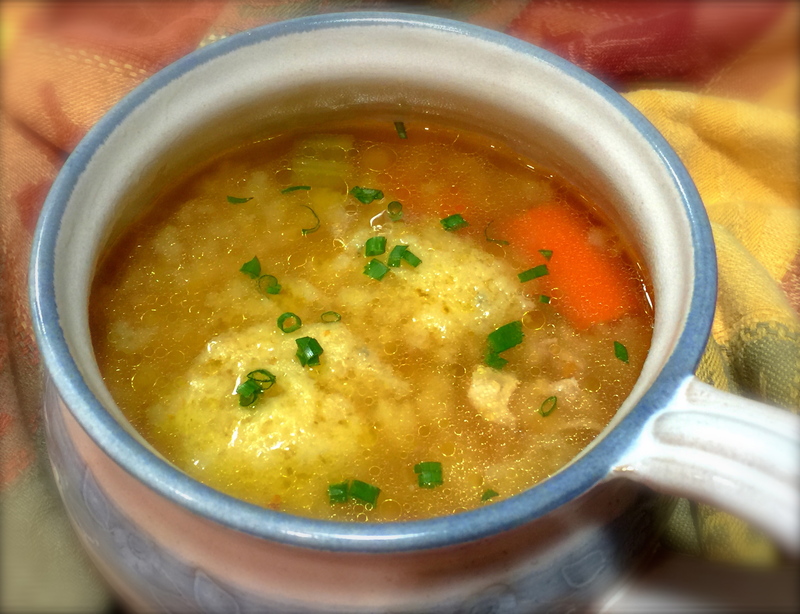 I’m sharing the chicken soup recipe today. As for the kugelis recipe (kugelis is a Lithuanian dish and basically a baked potato pudding) I’ll share another time. Whenever my mom would visit us I would always ask that she make this meal. No one could make it like my mom – but she did pass down those secrets to me. For years this was the only homemade soup I made. This year I ventured into making some others (broccoli cheddar and creamy tomato soups) and I now find it hard to believe why anyone would not make homemade soup. It’s so easy and most of the work, besides the chopping and dicing, is done in the pot. Lesson Learned 1 – Use a very large stock pot: I have a 6 1/2 quart LeCreuset stock pot that I use whenever I make soup and there’s a reason why. 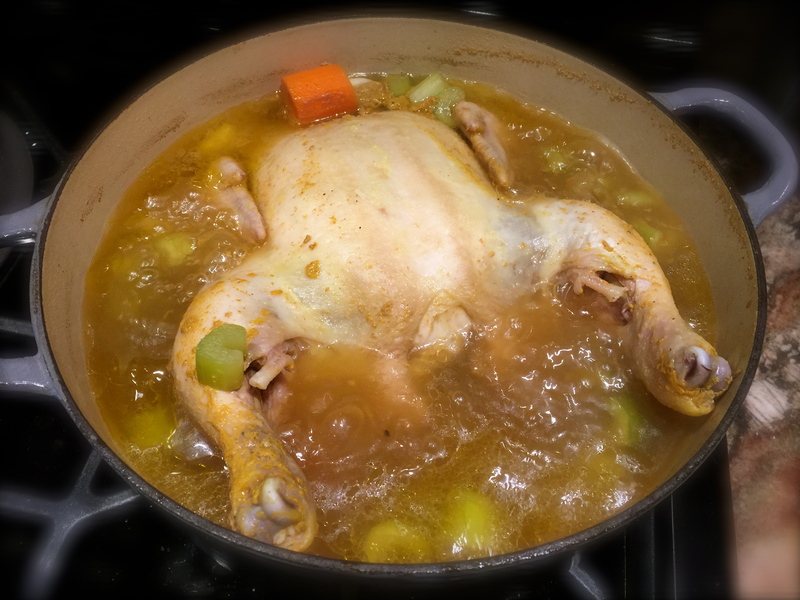 You need a big enough pot to put in a whole chicken and still have plenty of room for liquid. I make this recipe using a 5-6 pound chicken and it can take up a lot of room. I also like using an enameled cast iron pot when I make soup because of it’s ability to hold heat and provide even heat. There is no better way to cook than to use cast iron, but it has its drawbacks. Mainly it’s very heavy and it takes a little more time for it to heat up. But when you’re cooking something for a substantial amount of time, I find the way to get the best results is to use cast iron. Lesson Learned 2 – Don’t be afraid to make dumplings: Some people say they have no luck making dumplings. There is a trick to making them that basically ensures success all the time. Once you’ve spooned the dumpling batter in the pot, put the lid on and keep it on for at least 20 minutes – NO PEEKING. The dumplings need time to solidify and they only way they do is if you keep that lid on and let the steam cook them through. Don’t worry, you’ll have plenty of time to view your dumpling prowess after they’ve fully cooked. If you don’t do this, they will fall apart. So don’t be like my husband who likes to lift the lid of the crock pot mid through the cooking time to see how things are going. Keep the lid on and you will be successful! The texture of the dumpling batter should resemble a slightly moist sticky dough. I apologize in advance but this is a skill you learn with trial and error. Just remember that you don’t want the dough too runny nor do you want it to lack some moisture. Don’t worry, it’s not as hard as it sounds. The picture on the left shows the dough just a little too moist but almost the desired consistency. I think added another tablespoon of flour at this point and it turned out perfectly. Once you have combined all the ingredients in the recipe, if it looks a little dry add a little more buttermilk and if it looks a little too wet add a little more flour. The trick is to add the buttermilk or flour a little at a time at that point, so you don’t over mix but get the right consistency. One more great dumpling making secret: Before you start spooning in the dough, place your teaspoon into the boiling soup. That way when you drop in the dough it will easily release from the teaspoon. Do that every time and you’ll never have to worry about a lot of dough sticking to your spoon. That’s it. The rest is assembling and preparing the ingredients and letting the chicken and dutch oven do all of the work. This is a great recipe especially for this time of year. I hope you enjoy it! Wash chicken, remove any material inside the cavity and pat dry. (if the chicken has any innards such as a neck, liver and heart throw that in the pot as well). Put the chicken in a 6 1/2 quart stock pot. Season the chicken with salt and pepper. Add the carrots, celery, garlic and bay leaves. Pour in the chicken stock. Add the bouillon granules. Fill the remainder of the pot with water until the liquid is about an inch from the top of the pan. Cover the pot and cook for 30 – 40 minutes. (a six pound bird required 40 minutes on medium-high heat). 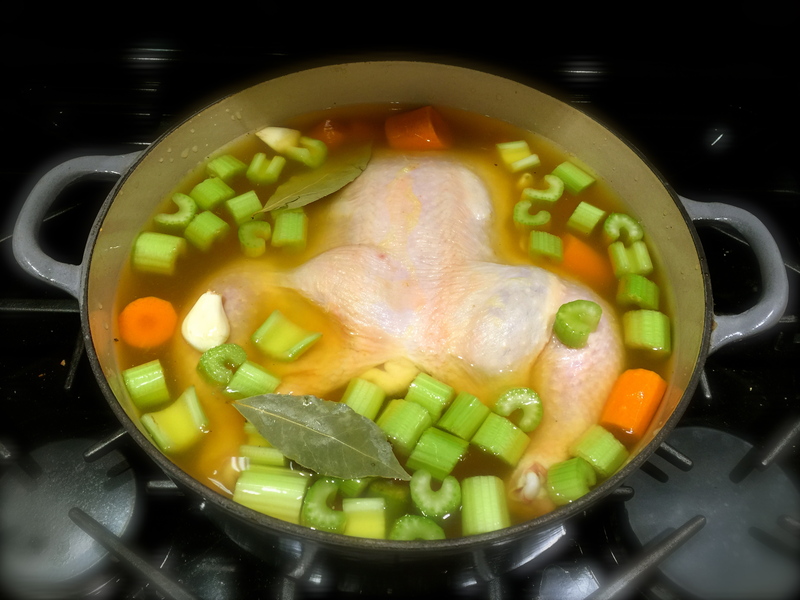 After 40 minutes, turn off the heat and carefully remove the chicken from the pot along with the bay leaves. The garlic cloves will basically disintegrate so you don’t need to worry about removing them. Allow chicken to cool slightly so that you can work with it. 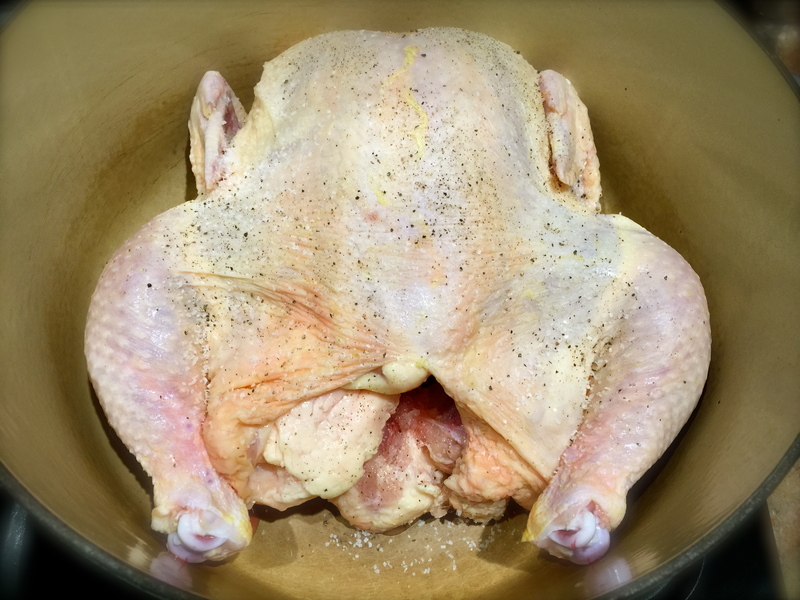 Remove all the meat from the chicken, being careful to discard any bones and skin. 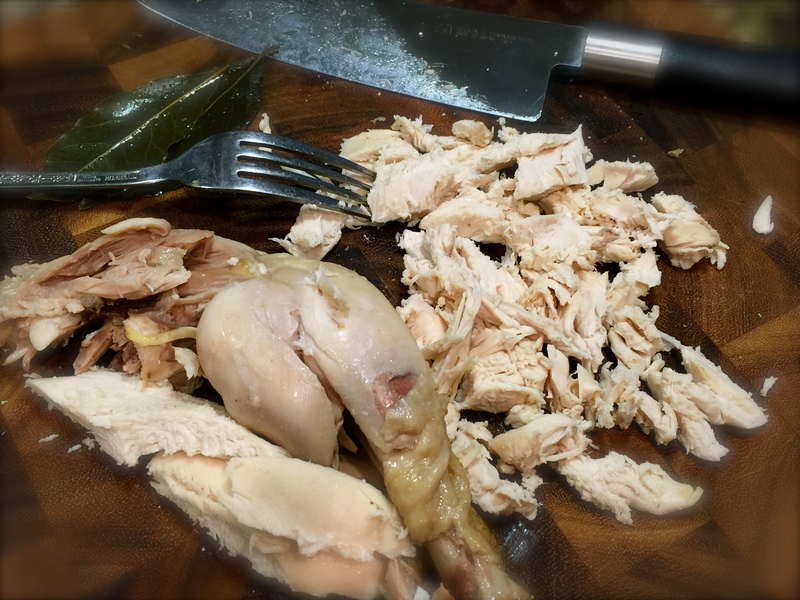 Chop the chicken meat into nice bite size pieces. Put the meat back in the pot, cover the pot and bring to a boil. 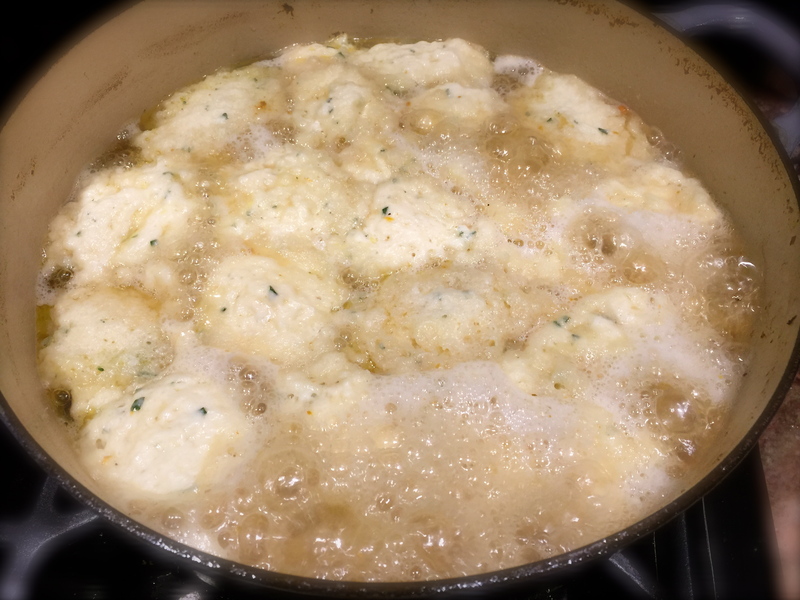 While the soup is coming back to a boil make the dumplings. Melt the butter and give it time to cool before adding it to the dumpling mixture. 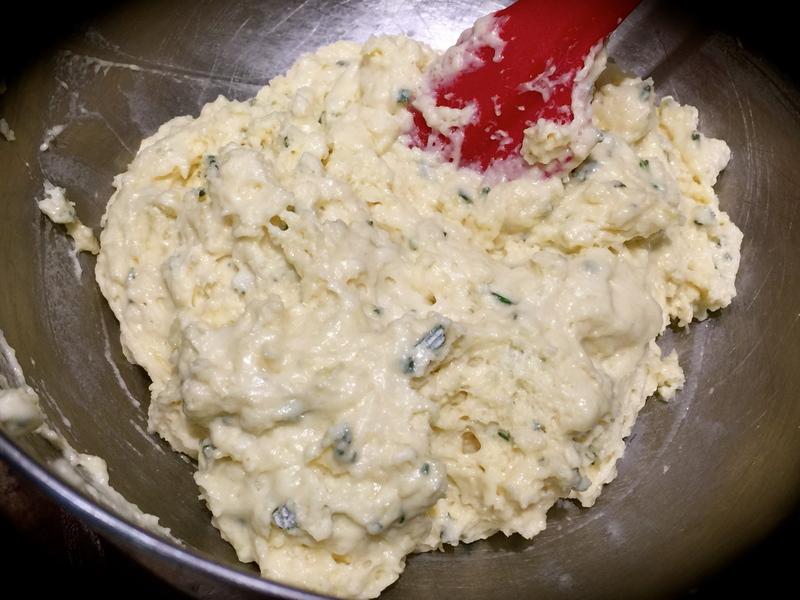 Combine all of the dry ingredients including the chives. Make a well in the dry ingredients and pour in the wet ingredients (it is important for the melted butter to be cool so that it doesn’t scramble the egg). Stir until combined. If the mixture is too dry add a little more buttermilk, if too moist add a little more flour. Remove the cover from the pan. If the broth is boiling quickly drop the dumpling dough into the pan by the teaspoonful. Once all the dough is in the dutch oven, put the lid back on, lower the heat to medium and do not take the lid off the pan for at least 20 minutes. The dumplings are done when a toothpick inserted in the center comes out clean. Please do and let me know how it turns out! This is the way my mom made chicken soup for us when we were growing up. Nothing was better, especially on a cold winter’s day! i agree, mom’s recipes never fail ! !